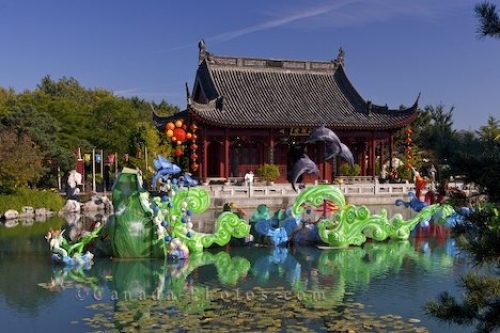 Lanterns are displayed in the water and throughout the Chinese Garden at the Montreal Botanical Garden in Quebec, Canada during the Magic of Lanterns Festival. Lanterns gracefully float atop the water with a traditional Chinese building in the background in the Chinese Gardens at the Montreal Botanical Garden in Montreal, Quebec. The Magic of Lanterns Festival is a yearly event where unique lanterns are made to help display the culture of China. Lanterns at the Chinese Garden during the Magic of Lanterns Festival at the Montreal Botanical Garden, Jardin Botanique de Montreal, Hochelaga-Maisonneuve, Montreal, Quebec, Canada. Please let me show you more of my pictures from my "photo gallery: Montreal City Photos". Picture of the beautiful lanterns in the Chinese Garden at the Montreal Botanical Garden in Montreal, Quebec in Canada. Pictures from photo gallery "Montreal City Photos"